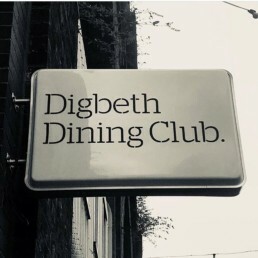 Multi-year UK Street Food Award winner Digbeth Dining Club asked us to produce their now instantly recognisable logo and promotional materials for their weekly street food event in Birmingham. 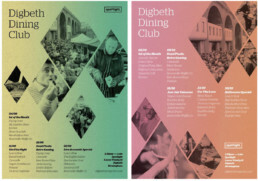 Artwork was used across social media, web and print with the ‘theme’ billing street food vendors like headline acts, the way you would usually see DJ’s and bands listed on event posters. This made it instantly appealing to the ‘club-going’ nightlife crowd the event first attracted. In contrast, the monthly line-up would always be referred to as a ‘menu’ fusing both food and music elements. As the brands popularity grew sub-brands were created for events in Codsall, Coventry and other UK locations. ‘Digbeth’ was literally scrubbed out with the guest towns name overlayed.